Here at the house it is still raining and all I know for the event total is that it stands at well over an inch. The TUS composite radar echoes at 6:20 am MST above indicates substantial areas of light to moderate rain occurring currently over and west of Tucson. 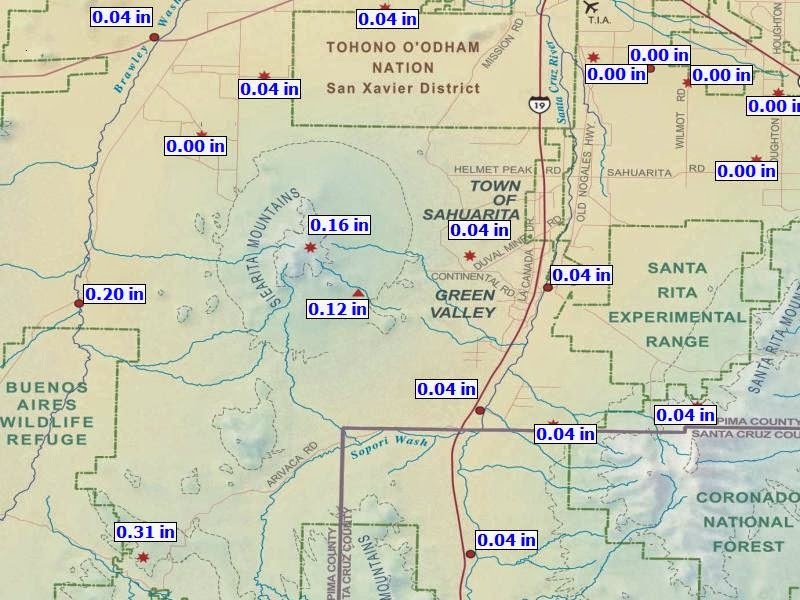 There have not been any thunderstorms within this event so far (nearest lightning down south in central Sonora) and snow levels have stayed quite high. The NWS observation site at the airport observed a daily record high rainfall amount yesterday at just under an inch. 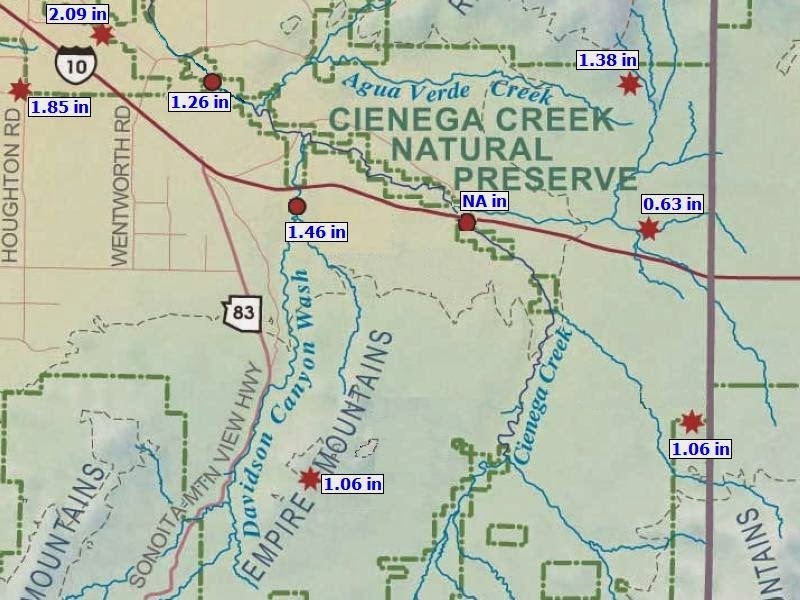 Amounts in the Catalinas and Redington Pass area have been prodigious, with some ALERT stations reporting 5 to 8+ inches of rain! Flow in the Rillito peaked at a bit over 4000 cfs around midnight - not a large flow, indicating that the ground has been soaking up much of the rainfall. 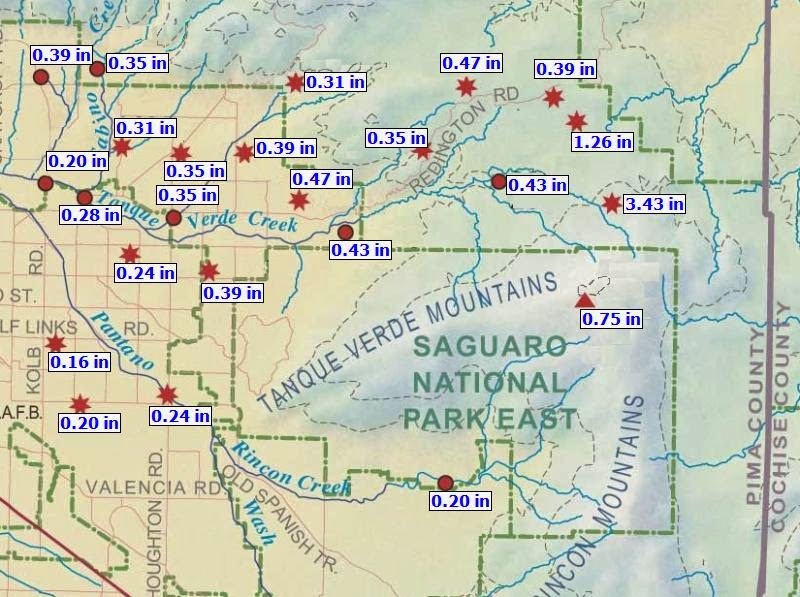 Below are rainfall amounts for the 36-hours ending at 6:00 am MST this morning (January 31st) for all the sectors of the Pima County ALERT network. Regional surface plot for 7 am MST this morning (above) indicates rain or snow extending from west Texas and northern Mexico northward into southern Utah and southwestern Colorado. The 12 UTC skewT plot for the Tucson sounding (immediately below) shows a mostly saturated atmosphere in place, with more than an inch of Precipitable Water, but only a touch of CAPE at this time - which fits with the lack of any detected CG flashes so far. Tucson radar composite reflectivity, also at 7 am (2nd below), indicates moderate to heavy rain mostly east of metro area at this time. Rainfall amounts so far (through 7 am MST) over the ALERT network are very heavy in the high elevations of the Catalinas and also across Redington Pass area - note two stations reporting amounts over 3 inches. There is no flow yet in the Rillito at Dodge, but I suspect washes on all sides of the Catalinas will soon be flowing, so caution is advised for morning commuters. The day has dawned heavy, dark, and damp and precipitation may begin a bit earlier this afternoon than the models are indicating. Already sprinkling here at the house. Satellite products continue to show a very broad plume of subtropical moisture moving northward into the Southwest. The IR image above and the CIRA blended PW analysis below are both from 13 UTC (6:00 am MST) this morning. All of the various models available to forecasters continue to indicate a major precipitation event for the Southwest, with a focus continuing to emphasize large rainfall amounts over southeast Arizona. Forecast below is from the WRF-NAM forecast run at 06 UTC this morning. The forecast shows accumulated precipitation through 11 pm MST on Saturday night (the 31st). The WRF models continue to keep the most significant snowfall up in the White Mountains, since this is another relatively warm system. The WRF also tries to backdoor a Plains front across the Continental Divide, bringing a complicating surge of strong easterly winds into parts of southeast Arizona. The latest runs weaken this front to our northeast as precipitation begins in earnest. But yet another feature to keep and eye on. What Will Thursday And Friday Bring? First - the showers that developed after 5 am MST yesterday morning ended up producing 0.04" or more at 31 ALERT stations (~ 30% areal coverage). The max amount measured fell at Mt. Lemmon with 0.59". Here at house we had 0.08", making total for the event 0.10". It remains very moist over the eastern Pacific, and model forecasts continue to advect this moisture from low-latitudes into the Southwest, setting up a significant weather event for Thursday and Friday. The water vapor image above (13 UTC this morning, January 28th) shows this moisture strung out south-to-north along 120 degrees W. The blended PW analysis from CIRA for the same time (below) shows a broad plume of high PW (values of 2+ to over an inch west of San Diego) extending from the tropics to north of 30 degrees N.
I am just going to show some forecasts from the 06 UTC run of the WRF-NAM at Atmo. The northeast blizzard of past two days illustrated full-well that too many models can lead to overload in the system, with erratic forecast outcomes. The no-show blizzard at Philadelphia and New York City are getting much media attention, while record snow amounts fell in parts of Massachusetts. The forecast above is on the 5.4 km grid and is for total precipitation through 11 pm MST Friday night, the 30th. 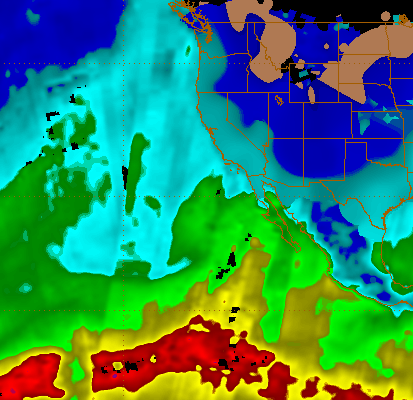 The model maximizes the coming storm over eastern Arizona and western New Mexico, producing some very large amounts. Forecast below shows amounts for the same period, but on the high-resolution grid (1.8 km grid spacing), with a large portion of eastern Arizona forecast by the model to receive over an inch - with some high elevation spots going over 5 inches. I don't immediately recall such a heavy precipitation forecast from the model. But, if such an event does occur, it would certainly be a significant storm to end the month. The WRF-NAM keeps temperatures aloft fairly warm during the event, with very heavy snowfall totals confined to the White Mountains. But all this is two days out, so we'll have to watch carefully as this situation evolves. Finally, the forecast soundings for TWC (bottom at 1 am on the 30th) gets PW up to amounts over an inch during Thursday night and then indicates some CAPE and possible thunderstorms on Friday afternoon. Ron Holle just sent me an email suggesting I look at how hot it is in Phoenix this afternoon. Wow - it is apparently related to the superbowl teams arriving and heating things up! Goes to show that things are always nicer in Tucson! Here at the house we had two periods of very light showers yesterday - one early afternoon and then one around 9:00 pm MST. Combined these left only 0.02" of rain in the gauge at 5:00 am this morning. But it is raining again (at 6:00 am) as two showers have moved off the Tucson Mountains into parts of the metro area - above shows TUS composite radar echoes at 6:00 am MST. At 5:00 am only 16 of the ALERT network stations had measured rainfall (remember that amounts less than 0.04" are below the precision of the gauges used and report as 0.00). Most of these sites were off in the southwest sector of the network - above. Gauge near Sasabe had greatest total at 0.31". 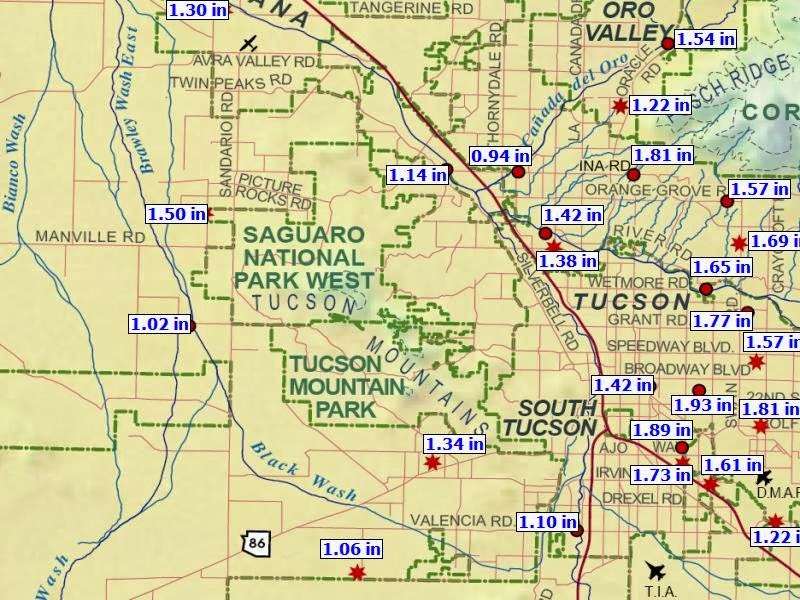 Further west in Pima County amounts were heavier - Sells at 0.37" and some MesoWest sites coming in over half an inch. So, widespread rainfall over southeast Arizona, but with amounts being very light - perhaps a better event at end of this week? Showers are occurring along the Borderlands and extend west-northwestward across Yuma and into the Mojave Desert. Above graphic shows Yuma composite radar echoes at 7:30 am MST this morning (Monday, January 26th). The 12 UTC sounding from TWC this morning (skewT plot below) shows a very substantial increase in PW this morning, with current values above 6/10 of an inch and higher values to the south. However, low-levels remain fairly dry at this time. Dry layer above 600 mb will probably moisten-up as winds aloft veer to the south during the day. The 500 mb closed low west of Baja has been inching west and northwestward during the night. The NAM 500 mb forecast from 12 UTC this morning (above) moves the low well west of northern Baja by 5:00 pm MST this evening and indicates only weak, positive-vorticity-advention over southeast Arizona. Various models had been quite consistent during last couple of days, forecasting a fairly significant precipitation event for most of southern Arizona. However, the latest, short-term forecasts have come in considerably drier. The WRF-NAM forecast run at Atmo from 06 UTC actually forecasts the event to slip-slide away to the west, with light precipitation also to the east over Cochise County and southwest New Mexico - leaving a large area of no rainfall centered about over Tucson (below, showing accumulated rainfall through 5:00 am MST tomorrow morning). The new 12 UTC forecast from the NAM (valid through same time tomorrow) is at the bottom and now indicates at best very light showers for the metro area. These zig-zags in the model forecasts as the event has drawn near are disconcerting. Today will apparently be a day for careful monitoring of the observations and radar data as the event unfolds. Water vapor image from 11 UTC this morning (above) indicates the upper-level cyclone located west of Baja and a large area of convection south of 20 degrees N. The MIMIC blended PW analysis for 09 UTC (below, from CIRA at Colorado State) shows that PW greater than two inches remains south of 20 degrees N, but that values of around an inch or more have pushed north across the southern half of the GoC. All of the various models move the closed low northward tomorrow over southern California and continue the push of subtropical moisture into Arizona and southern California. The details differ, of course, between various models but all forecast a significant precipitation for most of Arizona and particularly for southern California. The two forecasts of accumulated precipitaion shown here are valid through 6:00 am MST on Tuesday morning, January 27th. Above forecast is from the 00 UTC run of the WRF-GFS at Atmo, while below is from the 06 UTC WRF-NAM. Both forecasts keep the heaviest rains out over central and western Pima County, but still bring a nice event into the Tucson metro area. Tuesday...A chance of rain and snow showers before 3pm, then a chance of rain showers between 3pm and 4pm, then a chance of snow showers after 4pm. Cloudy, with a high near 35. Chance of precipitation is 30%. Above is a forecast from mid-day today (Saturday, January 24th) for a grid point in West Virginia. The forecast states that there is a chance for rain showers and no snow for one hour from 3 to 4 pm. It would be extremely difficult to be that precise for the day one forecast - but this forecast is for day four - Tuesday, January 27th. From my perspective, a truly absurd forecast to convey to the public. A fast-moving storm will impact the Northeast U.S. today, as it brings snow and strong winds to New England. 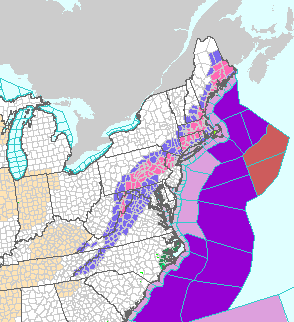 Above graphic shows current NWS alerts for that region. Here in the Southwest attention will be on the closed low that is strengthening off Baja this morning. This system will advect subtropical moisture northward over the weekend and bring showers and possibly some thunderstorms into southern Arizona on Monday. The 06 UTC run of the WRF-NAM forecasts PW values to increase to over an inch over portions of Arizona by 11 am MST on Monday (above - on the 5.4 km grid). Forecast below is for composite radar echoes valid at 1 pm on Monday, while bottom graphic shows model-forecasted precipitation through 11 pm on Monday night. This all is out at day three, so the details of how the situation will actually evolve still have considerable uncertainty. Currently the models are indicating a significant event for January. The GFS model ensembles, all 12 members, forecast rainfall for much of Arizona during the day Monday, which usually translates into rain in the gauge here at house. The long-range forecasts indicate the possibility for another Arizona storm as the Super Bowl crowd overruns Phoenix next weekend. Markedly cooler temperatures will blow into southeastern Arizona today - both on northeasterly winds over Pinal and much of Pima County, and on easterly winds over along the New Mexico border. The easterlies will be carrying higher RH with them. Forecast above is of 10-m winds from the 06 UTC WRF-NAM and is valid at 10 am this morning. While the nasty winter weather today is mostly over New Mexico and west Texas, the WRF-NAM does forecast some precipitation into far southeast Arizona today, particularly for parts of Cochise County. Forecast above is of composite radar echoes valid at 1:00 pm MST this afternoon. 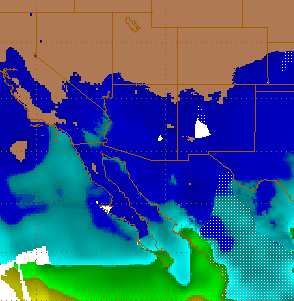 Below is model forecast of snowfall through 6:00 pm, indicating a fair amount for the eastern Chiricahua Mountains. It appears that the last week of the month will be considerably more unsettled for much of the state, so we will keep an eye out as the patterns evolve. Water vapor image above indicates the short wave in upper troposphere is located, south-to-north, over western Arizona this morning (image is from 6:30 am MST on 21 January). The blended PW analysis below (from CIRA at Colorado State, valid at 5:00 am) shows how little PW is accompanying this short wave over most of Arizona. Shown above and below are several radar images (all from around 6:40 am MST). Above is a base scan (0.5 degree tilt) from the PHX NWS radar that indicates some light precipitation over higher elevations to its northwest; substantial ground clutter noise over metro Phoenix; and little to the south. However, there is a wedge to the radar's south where the 0.5 degree tilt is blocked by the San Tan Mountains, so no radar coverage at lowest levels over that wedge. Image below is also from the PHX radar (KIWA is its ID) and shows echoes at the 3.5 degree tilt. 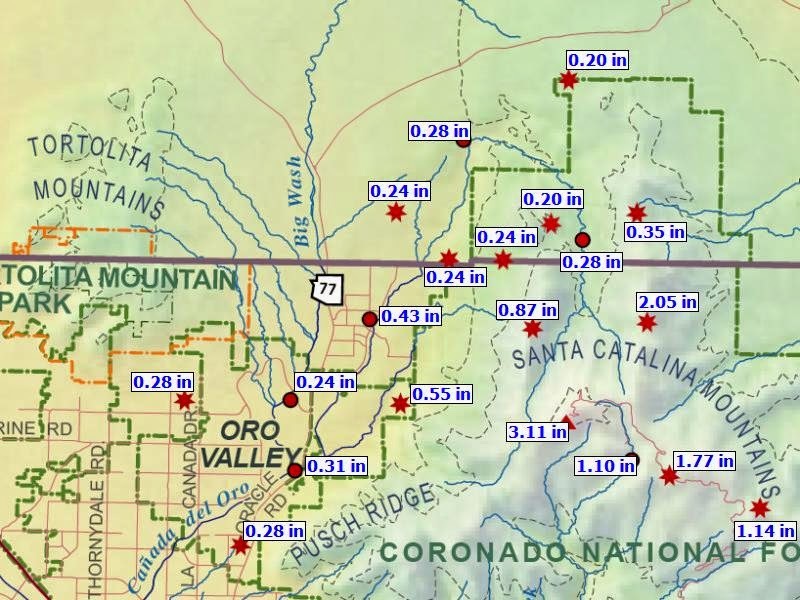 Echoes at that elevation tilt extend into Pinal and Pima Counties from north to west of the Tucson metro area. These echoes are from middle and high clouds ahead of the short wave. There is little precipitation currently, except far to the north over higher elevations. The image at the bottom is from the NWS TUS radar (KEMX is its ID) and this product uses the dual polarization signals to estimate types of hydrometeors - in this case the echoes aloft are identified as dry snow and ice crystals. These various radar products are available at the CoD weather page - link to right. Finally, a quick look at the 06Z WRF-NAM forecasts indicates that the model forecasts precipitation only to the north over the White Mountains and the Rim Country. Winds are forecast to shift to the west today as the short wave passes. The model then forecasts a period of moderately strong easterly winds to intrude over the Continental Divide into southeastern Arizona, as the weather system heads into the Southern Plains. These east winds are forecast to occur Thursday night into Friday morning, putting the Tucson metro area back onto the temperature roller-coaster. A short-wave trough will be coming by tomorrow tomorrow and Wednesday. Currently models forecast this feature to be somewhat starved for moisture and precipitation is forecast to stay off to the north the Tucson area. I thought that I would highlight a few forecasts from the 00Z WRF runs that Mike Leuthold is now running at Atmo. The graphics below show forecasts made by the 00 UTC WRF-NAM forecast cycle and are on the 5.4 km grid. This domain now extends well out onto the Plains. All the graphics (except for the one at bottom) are valid at 5:00 am MST on Wednesday, January 21st. Shown below are: 250 mb winds, indicating a moderate jet streak overhead; 500 mb winds and temperatures, with the short wave located north-to-south out along the western border of Arizona; 700 mb winds and RH; low-level winds and Precipitable Water (PW); and at bottom, total precipitation forecast through 5:00 am on Thursday, January 22nd. At this time the only "weather" forecast by the WRF variants with this system for southern Arizona are gusty southwest winds on Wednesday afternoon. 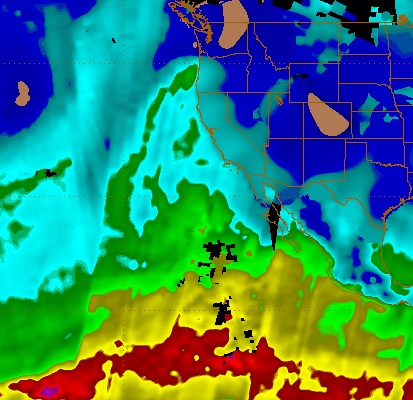 The accumulated precipitation forecast at bottom indicates very heavy rains at low latitudes southwest of Baja. There is at least some possibility that subtropical moisture will be pulled northward next week by the cyclone that is spinning out there - something to keep an eye on as we head toward the end of January.